Independence Day or Fourth of July in U.S is the most important day in American History. Continental Congress had been declared that all thirteen American Colonies had been represented a new nation without being dependent to British Empire. Every celebration of Independence Day is like tradition as firework, parade, barbeque, carnival, fair, picnic, concert, baseball games and family reunions. Since my childhood, the sky watching in the clear summer nights are my most memorable moments. The vivid sky can be watched in a quite night lying down on the hammock. So, your guess is true ! In Fourth of July, fireworks watching would be great when it combines with hammock backyard ideas. You may decide to have a hammock to catch this pleasure. In the hammock backyard ideas the things should be highlighted are the material, stand and size. The hammock material would be cotton or synthetic on the yarn or the fabric. Mexican Hammocks are hand weaving. A classical hammock can be hung in between two trees or two vertical stands . It can be hung into your porch supporting column or on your house wall and one supporting stands. In modern way, it has its own standing which is made of wood or metal. Mostly bronze, steel and aluminum stands are very popular. The hammock in the backyard can be a single or double size like mattress sizes. Enjoy having hammock in the backyard or enjoy reading the hammock backyard ideas and please remember me while you are entertained with fireworks and sipping my homemade ice tea. Very easy refreshing recipe for hot summer nights: Brew your favorite earl gray tea with cinnamon sticks and clove and just add crushed ice lemon juice and tart cherry juice concentrate. For 2 cup of ice tea without ice: Brew 1-tablespoon earl gray tea or 1 tea bag of earl gray with one cinnamon stick and five cloves. When it gets cooler add 1 fresh lemon juice and 2-tablespoon tart cherry juice concentrate and stir. Fill your half-cup with crushed ice and add the tea. This low calorie ice tea makes you feel better after a long exhausted day. You will be addicted to the healthy ice tea . The inspired hammock backyard ideas pictures are picked for your review. Picture Credit: Sydnye Pettengill ASID Interior Design Inc. , Exterior lighting in an ample backyard is just perfect for star constellations and firework. Swing in the steel stand cotton yarn woven hammock in the backyard is priceless. 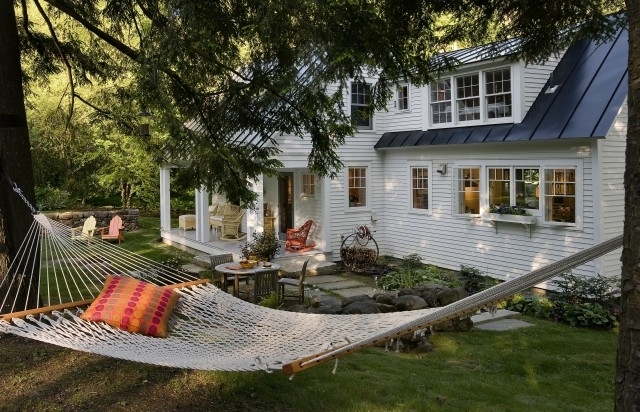 Picture Credit: Tobias Gabranski Architecture & Design via Houzz., Peaceful Deck of a farmhouse with my dream hammock. Imagine a fireworks in the night falling down on the lake like sparkles. Very keen eyes to spot the best place for the scenic. Picture Credit: Smith & Vansant Architects PC., Lovely double size cotton woven hammock in the backyard. Take a cat nap and read a book in day time and sipping a cup of wine or healthy ice tea in the night time. Picture Credit: Lands End Development- Designers & Builders, Rustic patio for summer gatherings. Hammock is synthetic fabric and hanging in between the trees. Very good set up . Picture Credit: Kaylor Landscape., Amazing contemporary landscape lighting. Backyard Pool and bronze stand hammock are like the irrevocable paired. All the backyard is open to sky welcoming the universe . Backyard lighting has a rich taste. Picture Credit: OBM Internatioal., As far as one can see- Only water and sky. Wooden stand women hammock is such a good example for hammock backyard ideas. Please add your valuable comments and share your opinions about your beloved hammock backyard ideas.